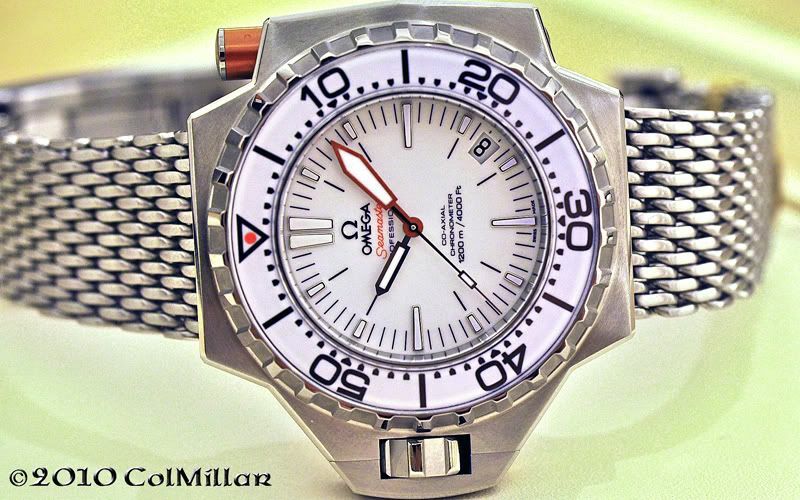 Whilst out in NYC in late July/early Aug I checked into the Omega boutique. 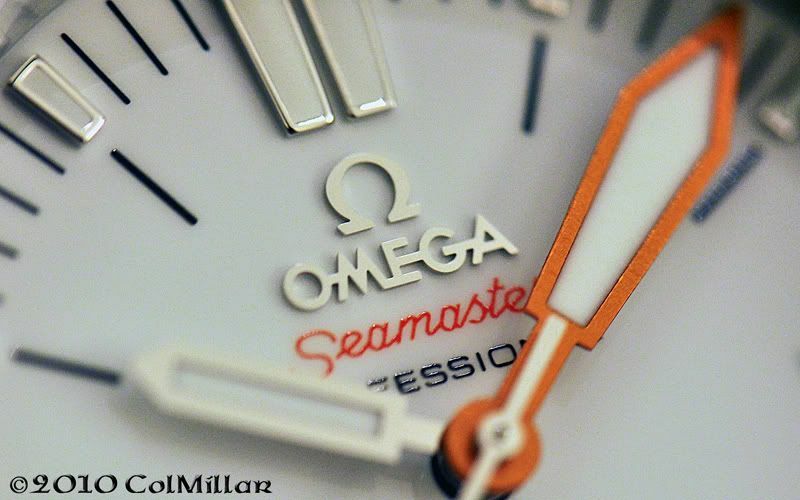 I've come to know some of the staff there, and though I've never bought a watch from them, it seems they enjoy having an Omega enthusiast visit and I've always felt welcome in the store. 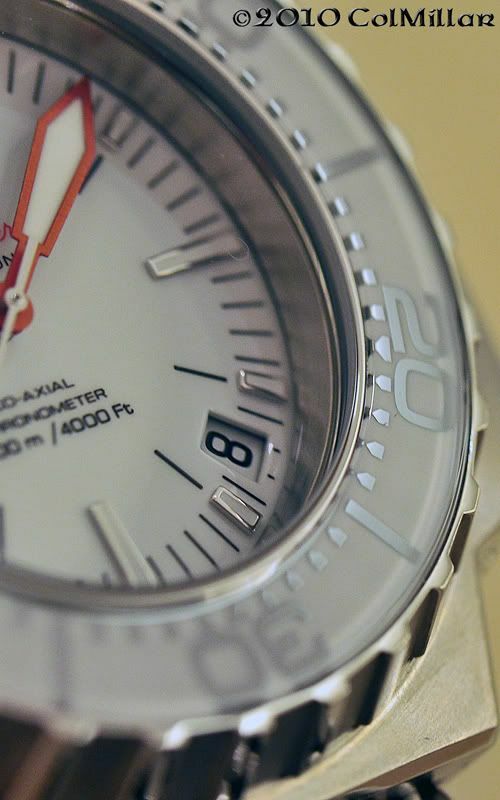 I managed to have a look at the upcoming SMP1200 with a white dial, a watch I've only seen factory photos of to date. The watch is due to be released in the US in December. I was surprised that I liked the white dial a lot more than the black dial. The white dial opens the watch face up a bit and evens out the light distribution, making the anodised minutes appear orange instead of black or red. The date alignment problem persists, but I'm hoping that someday Omega come to their senses on this. I apoligise in advance as the photos demonstrate the same WB problems I had shooting in the Omega boutique in Sydney: halogen lighting isn't optimal. With the brighter dial, the minute hand actually matches the bezel lock button much better and the design appears more cogent. Now for the "cool" part: the bezel numbers and minute track are done up in shiny metal (presumably SS or chrome) and the rest of the bezel is blue lume (presumably BG-W9). I was able to see this in the shop, but couldn't get a good enough photo to demonstrate the effect. Lume freaks will love it. Thanks for the review, Colin. 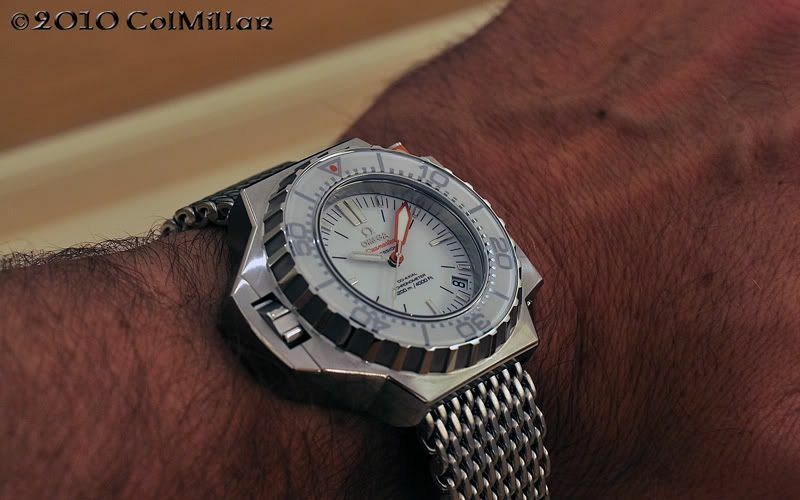 Wow, an amazing watch and I like the white dial much more than I thought I would. Would love to see some shots of the lume, which sounds very cool. Also love the color of the minute hand.While the 1200 looks great on your wrist, I'm pretty sure it would dwarf my girlie 6.75 wrist. So will this be on your wrist permanently in December? I'm liking the white more and more. Still think the white rubber strap is a bit much, but it looks SWEET on the mesh. Colin, thank you so much for sharing these photos with us. I've had a bit of a love/hate relationship with the 1200M PloProf ever since it was introduced, but this new iteration pushes me firmly on the "love" side of the equation. Yowza! Yup, I can hang with it. Anyway, it's good to know that this one isn't an LE, which gives me some time to save my pennies. True, I've got to scratch the AP ROO Diver off the list before I can take the PloProf plunge, but who knows, this one could be my first diver of 2011. If you want to hold off until 2011, don't go talk to Charles at the boutique Adam! You'll be reaching for your wallet in no time: it looks much better IRL than in these photos. I'm hoping for a blue dial myself, but am not holding out much hope. Not a fan of white rubber (ordered my U-1W with black), but the milanese looks incredible. It's every bit as comfortable as the vintage milanese, but it's thicker, heavier and more adjustable so one won't need extensions, etc. It needed to be heavier to balance the heavier head. 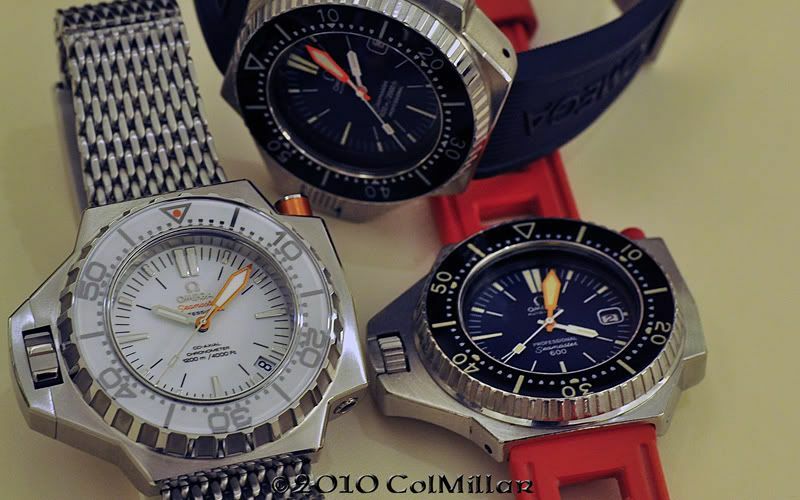 Not only that, but apparently the new style milanese will be made in smaller lug widths to fit other Omega divers. Hi Colin, any price indication for the white dial? She does look stunning with the white face. 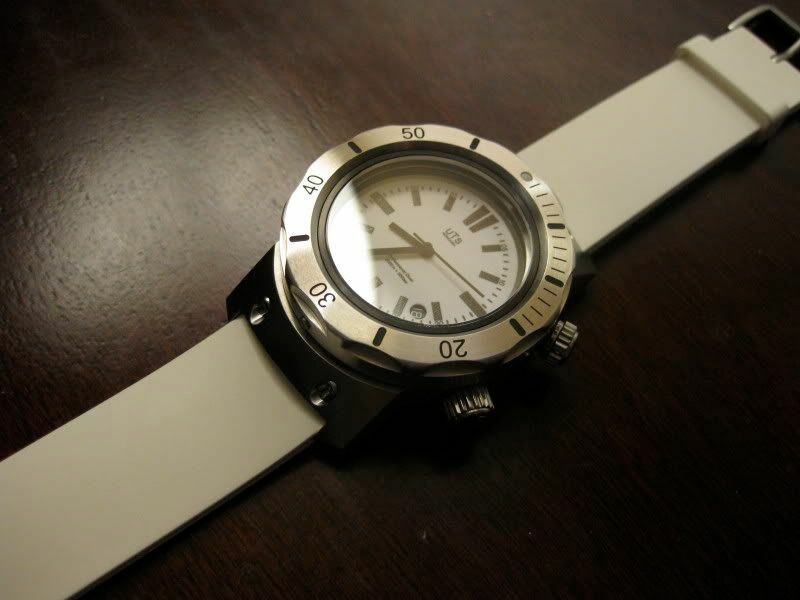 The Ploprof really is a great watch - and the white face only makes it that much harder to resist pulling the trigger. Thanks for the photos! I didn't ask and assumed it was the same MSRP as the black. I will ask next time around and will double tap with an email. You nailed it right there, Colin: 1) it's truly different from the original, and 2) it's rocking the 8500.